(8) Trim the outer canvas edge to between 1/2” and 1”, depending on the shape of the piece and the size of the canvas. You will fold this back to the back side of the needlepoint and you want to minimize layers layer. Clip the canvas toward the stitching to ease it around curves. Snip to within one canvas thread of the stitching. You may sometimes need to remove a wedge of canvas. (On a square you just need to trim the corners to about two threads out and fold and miter them.) Trimmed canvas, canvas stitched to back and needlepoint prepared for backing and finishing. What I do is take the trimmed canvas and begin folding it on the edge of the stitching to the back. I go all of the way around the piece, to kind of convince the canvas this is what it wants to do. Then I go back and fold it back again, more firmly, and where I see it buckle as I go around a curve, I clip that wedge off. Then the back of the canvas will lie flat and smooth. When I’m finishing a piece that has open canvas areas, I first apply a backing fabric (gold lamé is nice), basting it to the back of the stitches, just at the outer edge of the stitching. Sometimes I add a muslin backing to that (esp. if it’s fragile). Then I’ll fold back my edge of canvas and trim it. (9) When the canvas is trimmed, I’ll tack it down flat to the back of the piece with long basting stitches. I made some in a contrasting color in the photo so you can see them. (10) Now you have your needlepoint ready to go, a cardboard to back it, with batting on it, and a cardboard piece with the backing fabric stretched over it. 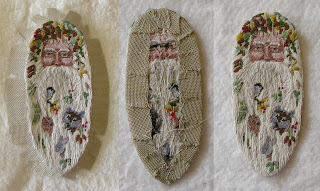 (11) Layer the backing, face down, the batting covered card, batting up, and the needlepoint, face up. Pin together along the edges. (12) Now’s the time to stop and consider your trim options. You can just use a ribbon or cord loop. If so, you’ll want to attach it to the back of the needlepoint now so it’s positioned where you want it. You can lay your trim around the piece now and get a good idea of how it will look. If you just have a skein of floss or perle at this point, just twist it to approximate the size you’d like and lay it along the edge. I tried two skeins of Watercolors and a thick cream and gold cord before settling on the solid gold cord. Make your twisted cord if you need to do so. Measure the circumference of your ornament plus the amount you wish for the hanging cord (if you choose to have a hanging cord-no loop for a brooch, a short loop for an ornament to hang from a hoop, a longer loop for a doorhanger, and an even longer loop for a scissors fob). If you just plan to add a hanging loop and no cording, then add it now, stitching it securely to the back of the needlepoint in the exact center top (see step 13). If you choose not to have a cord, be very careful with step 14 to make sure your stitches are unobtrusive. (13) Find the center top or balance point of the design. If that isn’t clear from the needlepoint design, put a straight pin through the layers at the point you think is the center and hold the pin, letting the ornament hang. See how it balances and move the pin until it hangs the way you want. That’s your center point. (14) Using regular sewing thread to match the needlepoint, begin stitching at the top of the ornament, about 1/4” from the exact center top (there the hanging cord will go). Whip stitch around being sure to catch the backing fabric and needlepoint canvas with each stitch. Do not stitch just through the embroidery on the front, be sure you go through the canvas. Stitch until you’re just about 1/4” from the top (so there’s a 1/2” gap unstitched at the top). 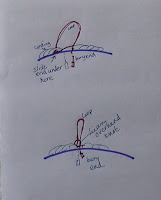 (15) Decide how you want to create your hanging loop. I drew some options here and I’m sure there are others. These are the two I use most often. If you’ve made a twisted cord, then you don’t need to plunge the beginning end. Just lay the looped end at the center point and begin stitching the cording on. If you’re using a purchased cord, wrap a piece of tape around the end and push the taped end into the center of the piece, between the two cardboards. Maneuver it so it comes out where you want it-exactly at the center top or just to the right or left, depending on how you plan to finish the loop. Then fold the cord along the edge and begin stitching it down, securing it where it comes out. (16) To sew twisted cord, I take my needle from the back to the front between the twists of the cording. Then I take a small stitch from the front to the back. You can tighten or loosen the twist in the cording by twisting it as you go. You want to keep an even twist around but sometimes it helps to have a bit tighter twist on curves. Also, if you find you miscalculated and are running short of cord, if you untwist a bit, you’ll have a bit more length to work with. I generally take a stitch every other twist in the cord but it depends on the size of the cord and tightness of the twist. This isn’t a structural component so it doesn’t have to be rock solid. On the other hand you don’t want it to be so loose it will gap or catch on something. The gold cord I used on the Santa looks complex but it’s actually just two bundles of gold threads twisted together. Some cords have three or more cords twisted together. Here I’ve untwisted a bit of the cord to show the space between the strands. (17) As you near the top of the piece again with the cord, you will need to plan the finish. For no loop just tape and cut the end of the cord, leaving about 1” to plunge inside. This is why you leave that gap in the initial stitching. Plunge the cording, making sure there are no gaps between the start and end, and stitch the opening shut and the cording to the piece. For a loop, create your loop. Tape and plunge the last inch of the end. Once again, stitch the gap closed and stitch the loop, it’s knot if there is one, and the beginning and end of the cord very securely to the piece. A loop has stress on it and needs to be secure. End off your thread and you’re done! What a pretty ornament this is! You have a beautiful ornament. And what a great tutorial for all. Lovely work as always. I write about my creative activities, mostly embroidery, and my garden with the occasional giveaway or tutorial.